We begin our tour in Colombia’s capital and make our way to the coffee region. Here we will learn about the coffee culture and it’s people. We then head north towards Medellín, considered by most as Colombia’s most beautiful city and recent recipient of the worlds most innovative city. After experiencing this metropolis we make our way out of the mountains and towards the caribbean, where we will be spending a couple of days in Cartagena. After our rest in this lovely colonial city we begin our way back towards the capital, but not before spending time in the lovely beaches of Palomino, the unique natural area of Los Estoraques and the beautiful colonial towns of Barichara and Villa de Leyva. In 16 days of motorcycle riding you will experience the wonders of the whole continent of South America. In Colombia temperatures can vary between 10°C to 40°C (50 F to 95°F) depending on what region we are in. While driving over the mountain passes, temperatures can drop for short periods of time but generally we go from warm to hot weather. It is recommended to ride with ventilated riding gear. Rain suite or liner is highly recommended to protect you against low temperatures through the mountains. Possible short rain showers can occur year round. Novice – Intermediate. Mostly paved roads. No off road experience required. Passengers OK.
Free Day Bogotá. Riders meeting and motorcycle pick up. During your short stay you can visit the gold and emerald museum. The historic city center and the Botero museum among others. Bogotá – Honda. Today we will head northwest trough the most fertile land “Savanna de Bogota” making our first Andes pass and making a quick stop at Armero. We will drop down to 0 MASL arriving to the colonial town of Honda. Honda – Armenia. We ride from Honda to the heart of the coffee region. Mostly mountain roads with a mountain pass at 3600mts. If time and weather permits we will visit the beautiful Cocora Valley. We spend the night in a lovely farm turned boutique hotel. Free day Armenia. On this day we will have plenty to do for those who want. We can an organize a tour of a coffee plantation along with a coffee tasting. The afternoon is yours for relaxing, horseback riding, bird watching. Armenia – Medellín. We will take the beautiful roads through the coffee región and embark on a road that follows the Cauca river turn by turn and takes us to the beautiful colonial town of Santa Fe de Antioquia. Here we will visit the Bridge of the West. Free day Medellin. Today can organize different activities in Medellin, including a city tour with the new cable car system, pueblito paisa, museums, Botero Square or you are free to relax and eat in the many great restaurants. Medellín – Planeta Rica. On this day we make our way from Medellín to get closer to Cartagena. 2 thirds of the way between Medellín and Cartagena, we stop for the night to get some rest and the next day we continue our journey. Planeta Rica – Cartagena. This will be the halfway point of our tour. And what better way than by arriving to the amazin caribbean city of Cartagena. A UNESCO world heritage site, and one of the most well preserved historic centers in the caribbean. Free day in Cartagena. Today we can head to the beach or visit some of the cities attractions such as the fortress of San Felipe, Cerro de la Popa or just hang out in the city center and enjoying local cuisine that will leave you breathless. Cartagena – Palomino. We leave Cartagena and border the caribbean coast towards the beautiful beaches of Palomino. A short ride will have us arriving at lunch time at our hotel, so we can have the rest of the afternoon relaxing on the beach. Palomino – Estoraques. 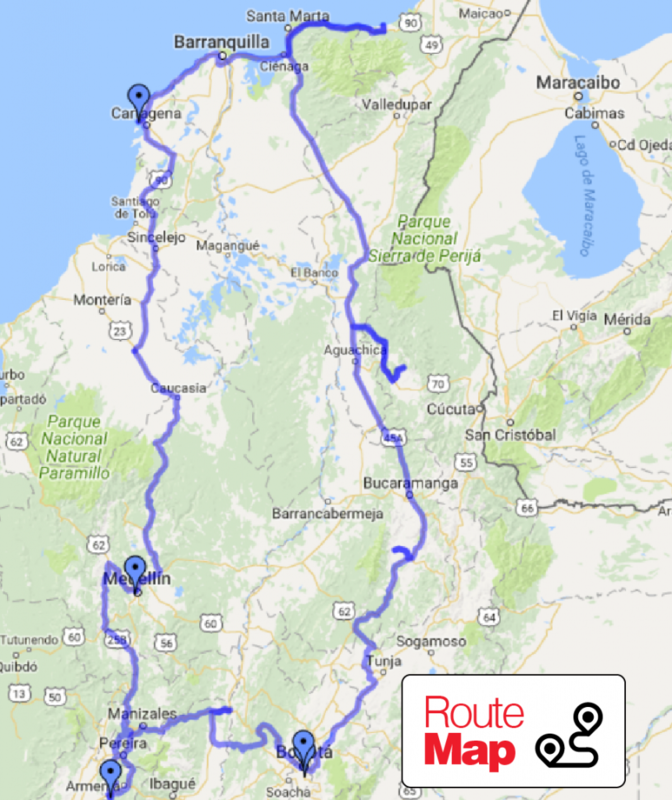 e first half will have us going through relatively flat roads but we are rewarded in the end by a stunning mountain road that takes us up to the city of Ocaña and afterward the tiny lovely town of Playa de Belén. Barichara – Villa de Leyva. From colonial town to colonial town. In the morning you will have the opportunity to explore Barichara. Before lunch we hop on the bikes again and ride a relatively short distance to our destination. Villa de Leyva – Bogotá. Our last day. Once again you will get to explore Villa de Leyva in the morning. And after lunch we ride our last stretch that will bring us full circle back to Bogotá. We will have a lovely goodbye dinner and share our stories..
Clients head back home. For those wanting to stay an extra day or two we can arrange.